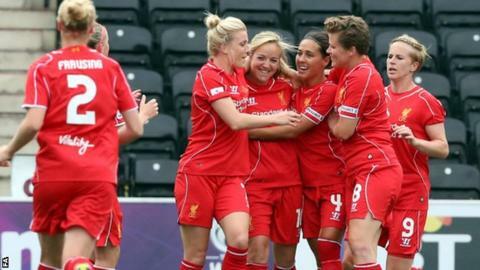 Liverpool will make their Women's Champions League debut as one of three British clubs playing in the round of 32 this week. The reigning Women's Super League champions entertain top Swedish side Linkoping in Wednesday's first leg. Manager Matt Beard cannot wait to see his team follow in the footsteps of the great Liverpool men's sides that have lit up Europe over the years. "It's going to be a fantastic occasion for the club," he said. "There's a great anticipation and excitement amongst everyone involved." Liverpool, who won the Women's Super League for the first time last year, may be European novices but Beard says they have a number of players with Champions League experience and that could prove vital. An ex-Everton quartet turned out for the Toffees in the competition while German defender Corina Schroder was a winner with Turbine Potsdam. "The girls who have played in Europe have been passing their experiences on to the other players and we are absolutely ready for this," Beard said. Bristol Academy, WSL runners-up last year, step into the competition for the second time with a first leg away to Dublin-based Raheny United on Thursday. Maintaining focus will be key to Bristol making progress, says manager Dave Edmondson, whose team will be favourites in their tie. "Raheny are a good side - they're fit, pacey and they've got pretty good experience of playing in the Champions League," Edmondson said. "What we have to do in this tie is take the best elements of our play and put them together over both legs to take us into the last 16." Also on Wednesday, seasoned European outfit Glasgow City kick off their seventh successive campaign with a first-leg trip to Polish champions Medyk Konin. Glasgow, who recently clinched the Scottish Premier League title for the eighth successive time, are - like Bristol - also seeded and will be expected to go through. But after an injury-hit domestic season, head coach Eddie Wolecki Black is taking nothing for granted. "We've had five players out injured the whole season," Wolecki Black said. "It's been very difficult but the girls have maintained good standards. "What I want from them on Wednesday is to show maturity and good game management, and if we do that then we can come home with a decent result."